Parking lot striping is not necessarily something that you think about daily, but it is one thing that is very important in society. The stripes on a parking lot guide you in the direction you should go, they show you where you can safely park your vehicle, the stripes indicate fire lanes, and no parking zones. Essentially the markings on a parking lot keep you and others safe while driving in a parking lot area. Located in Williamson County and part of the Greater Austin, Texas metropolitan area, Round Rock is one of the fastest growing cities in the United States. When you have an area growing so fast, you also have a lot of businesses moving into the area. We love seeing this, because when you have businesses, you also have parking lots that need striping. 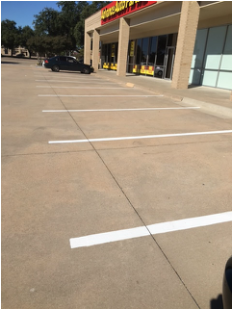 We take pride in keeping Round Rock looking great, and we know that as a business owner your first impression is made the very moment your visitor or customer drives onto your parking lot. If your parking area is well maintained, and clean this definitely leaves a great first impression for everyone that visits your business. Fun Fact: The city of Round Rock is named after a large round and anvil-shaped rock located in the middle of the Bushy Creek along the historic Chisholm Trail. We use the best products in the business as well as the latest technology, to ensure your investment will last, as well as making your parking lot look beautiful, professional. We stripe with consistency, meaning the paint color and width are always consistent throughout your entire lot. We pride ourselves in painting the straightest lines in the entire Austin Metro area. No matter if your parking lot is asphalt, or concrete, we can make your parking lot look great, and we always use the proper tools and materials for the job. There is no striping job too small or too large for us to handle. We treat every job like it is our own parking lot, so in the end you have the finest looking parking lot in town. When you look good we look good. Our goal is to have you tell all of the other business owners in round rock about us. Does your parking lot currently have, or does it need speed bumps? We do both installation and removal of speed bumps in your parking lot. Speed bumps help to control speed in the lot resulting in a safer area for visitors while in the parking area. If your current lot already has speed bumps we will make sure they are well maintained, and if necessary painted so they are visible. The last thing you want is for the speed bumps to be hard to see resulting in damage to vehicles or bodily images due to tripping over hard to see speed bumps. You definitely want to make sure your parking lot stays in compliance regarding fire lanes and handicap parking areas. Never fear, you do not need to know all of the compliance rules yourself, because we have you covered. 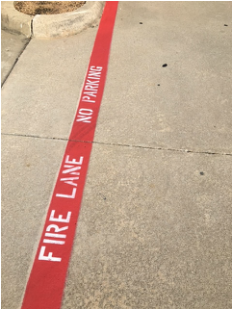 We know all of the specific city codes regarding fire lane restrictions, and will make sure you are in compliance before we finish the job. As you are probably aware, back in 1990 the American Disabilities Act (ADA) went into effect. The ADA requires every business to maintain a mandatory amount of handicap accessible parking spaces based on the number of parking spaces per 1,000 sq. ft. of utilized parking space. There is also another restriction based on the size of the parking lot which may require you to also have handicap van accessible parking as well. Again we are fully aware of all the guidelines regarding ADA and will make sure you are compliant. Rest assured your parking lot is in the right hands when you contract to work with our team. We also provide all types of signage you may need for your parking lot. 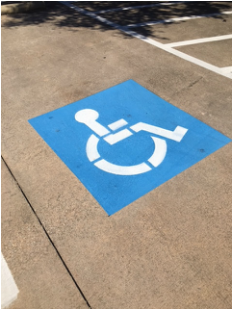 Do you need handicap parking signs installed, or signs indicating no parking zone areas? Let us know and we can make sure and provide fresh new signs to really make your parking lot pop. If you are in need of specific signs that may not be standard, please let us know and we will do our best to get the signs you need. If you already have signs, we can also install them for you. 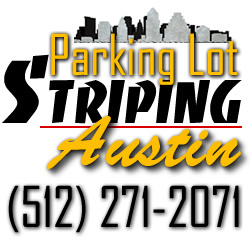 If you own a local business in the Round Rock or Austin Metro area, we are ready to help you get your parking lot striped, and looking its best. Here are a few of the types of businesses we have serviced in the past. If you do not see your type of business on this list, no worries, we would love to add you to our ever growing list as well.